So, there is thing garden plot outside my front door that used to be maintained by a woman a few doors down. She planted flowers and other plants (not vegetables or food plants) in there for years, ever since I can remember. It was last year or the year before that the people who run the neighborhood had the people who cut the grass and other stuff dig everything up out of the garden plot and dig up the plants in some people’s yards. We don’t know and there really isn’t any reasonable explanation for why they did it. They put in a few common and cheap flowers in there but mostly mulch. This year though, this vine like plant with huge leaves came up (early in the spring). It grew fast and soon we noticed these orange flowers after awhile. 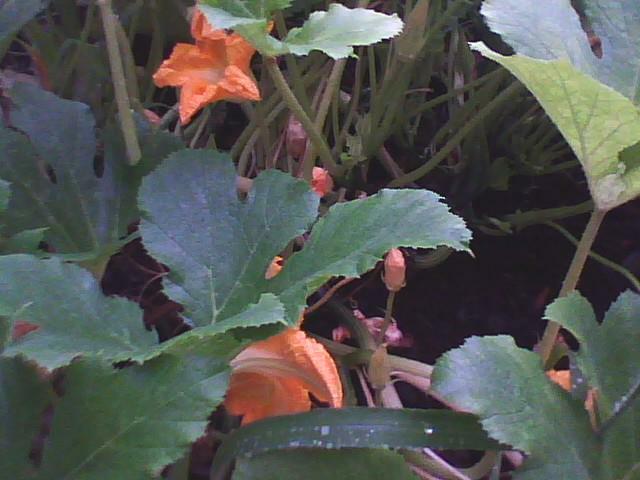 My mom called them squash blossoms and sure enough, somehow, it was a squash plant. No one in the neighborhood grew it, heck, you’d be lucky if half the people in my neighborhood recognized a zucchini if they saw one. It grew and grew and grew and at one point, the mailman was scared of it, having the idea that maybe one day when he went to put the mail in the mailbox that it would grab him, pull him into the thickest part, and eat him. We kept seeing flowers, but no squash. No bees on the flowers either. One day, my mom had the idea to fertilize the flowers with each other so my dad brought a couple of the flowers together, shaking the pollen into each other. 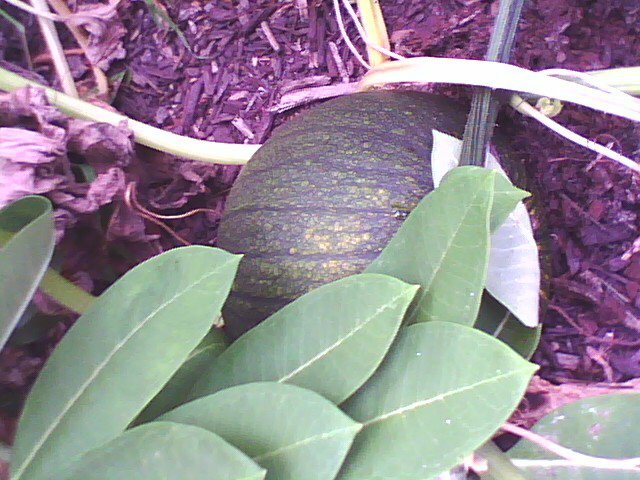 Voila, not a whole lot later, maybe a couple weeks, we noticed that squashes had started to grow! 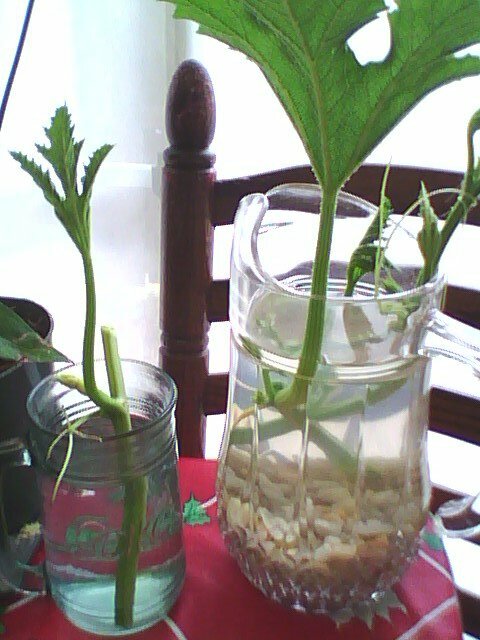 So, I decided to snap a few pieces of the vine and me and my dad put them in containers of water so they would sprout and we could have our own squash plant. My parents think it’s pumpkin but I’m going more for acorn squash. Anyway, it must have been a bird that started this all (having eaten a seed and pooped it or dropped it in the garden plot). My aunt says a tomato plant mysteriously started growing one year in her backyard thinking it was most likely a bird too. Yay for birds! 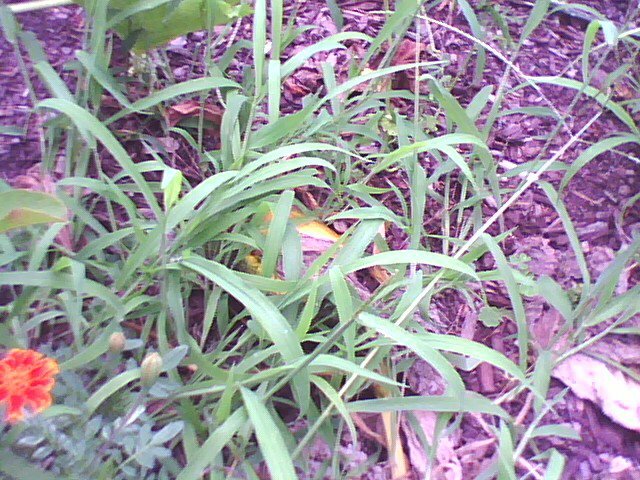 This entry was posted in Nature in it's Mysterious Ways, Roses (Plant Category) and tagged Birds, Clippings, Gardening, Happy Surprises, Nature in it's Mysterious Ways, Roses (Plant Category), Sprouting, Squash Blossoms, Squash Plants, Surprise Plants, Tomato Plants. Bookmark the permalink.